If you still think of Jason Momoa as Game of Thrones' Khal Drogo, the upcoming Justice League will wash that out of your brain with a few gallons of ocean water. 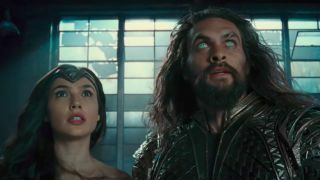 It's the first chance we'll get to see Momoa as King of the Seven Seas, Aquaman, and to find out how he fits into the gang of super heroes. Subscribe to Total Film magazine here. "Me and Cyborg do not get along at all. I don’t trust him as far as I can throw him," Momoa tells our sister publication Total Film magazine. "Over time, that will change. It’s the same thing with Bruce [Wayne]. I’m like, ‘Nah, I’m not buying into it." If you've seen the trailer, you've already seen Momoa deliver the scathing line "dressed like a bat. I dig it," on seeing Batman in all his Dark Knight glory. Meanwhile The Flash, played by Ezra Miller, is “like a younger brother” both on-screen and off, says Momoa. He also calls Gal ‘Wonder Woman’ Gadot “literally one of the most beautiful human beings that has ever existed” and describes Henry ‘Superman’ Cavill is “the one who taught me the most... He gave me all the pointers.” It's like one, big, super strength family. Subscribe to Total Film now and you’ll never miss an issue (as well as saving money on the cover price). Get the digital version for your tablet or have an exclusive subs cover through your door every month - or save even more with a print / digital bundle!